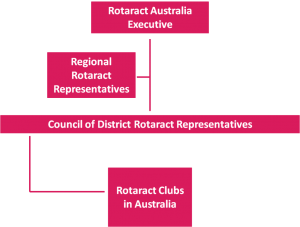 Council of DRRs – Rotaract Australia’s governing body. The Council is made up of the District Rotaract Representative from member Districts; these roles are elected by the Rotaract membership to support Rotaract Clubs in their District. DRRs decide which activities are undertaken by Rotaract Australia, with each DRR of a member District holding one vote on proposals put towards the Council. The Council of DRRs elects the Executive, including the Chairperson. The Executive Board is responsible to the Council of DRRs for the implementation of Rotaract Australia’s activities.